If termites are a problem that you are dealing with, then there are hopefully a few things you are already well aware of. One, being that something must be done as quickly as possible or else the problem will escalate into a full-blown catastrophe. The other is that whatever is done will likely involve the use of a pesticide. The first unfortunate fact is one thing, but the second can pose a real hesitation in anyone who has pets or kids, as pesticides don’t exactly sound nutritious or delicious. 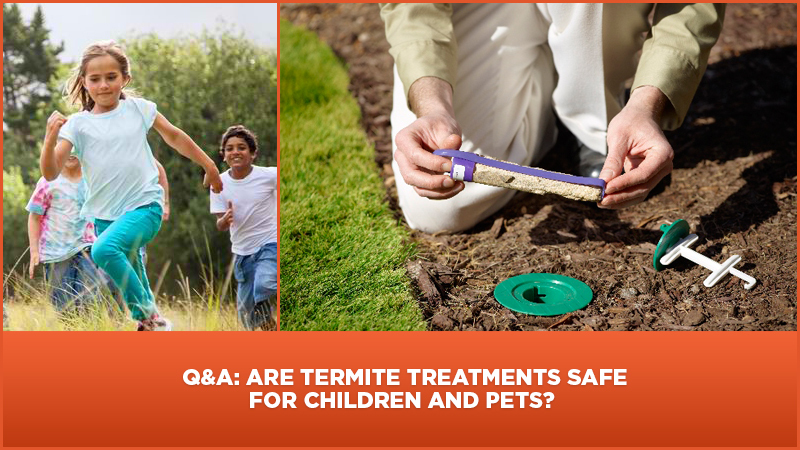 So the question remains: are termite treatments safe for children and pets? The safe assumption is “no.” Pesticides are known to be toxic. On the one hand, you can’t do anything about termites, as a collapsing structure is also hazardous to everyone’s health, yet you are hesitant to employ chemicals which could be dangerous. What then is the answer? Well, Exterra uses a bait called Requiem™, which is as harmless as salt to pets and children. While other pesticides are to be assumed hazardous, they can still be used efficiently and safely, with a proper professional application. We set up applicators or pods which are easily accessed by termites but not easily accessed by children or animals. In extreme cases, a house will be ‘tented’, in which case the entire place will be vacated until the half-life of the pesticide subsides, and no threat will come to kids or animals, so long as they stay out of the house until it’s safe to return.